After years of using and cursing your factory DSLR support strap, you begin to realize there must be a better way. You don’t want to go crazy with DSLR shoulder mount, but you need a camera clamp that will let you go from “support” to “shoot” in a second. 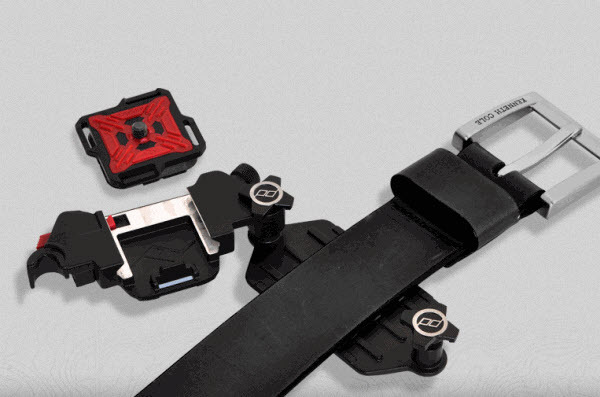 Enter Peak Design’s Capture camera clip system – camera clamped to your belt or backpack one second and tripod mounted the next. Seriously. Once the clamp is secured to your strap of choice, the camera (with clip attached) slips into place with one quick motion. An audible click tells you that it’s secure. When you are ready to shoot, just press the release button and the camera slides out smooth as can be, and you are ready to shoot or attach to your tripod. If you plan on some serious jostling (like climbing or 4-wheeling) you can engage an extra lock to prevent any accidental unlocking. Clips are available to fit Arca or Manfrotto RC2 style heads. Out in the elements – don’t worry. The Capture clamp is made of die-cast aluminum, the release button is thermoplastic and the clamp bolts are cold-forged zinc alloy. It comes with a lifetime guarantee. When was the last time you got one of those? The Leash is another support system for your camcorder or DSLR that is entirely different – but uber handy in its versatility. Instead of those annoying split rings that normally hold your gear, the Leash comes with four anchors that will support two cameras, camcorders, binoculars, recorders, whatever. The anchors simply loop onto the neck strap bracket or d-rings of your gear and then with one, quick motion, snap into the slim, seatbelt-grade Leash strap. I use it for my small Sony Handycam camcorder that didn’t come with a shoulder strap. When I want the camcorder on a shoulder strap, the Leash is a perfect size. When I want the camcorder on a tripod, two quick pushes and the Leash is released and I can fold it and stick the strap in my pocket. Another great use for the Leash is as a camcorder stabilizer. 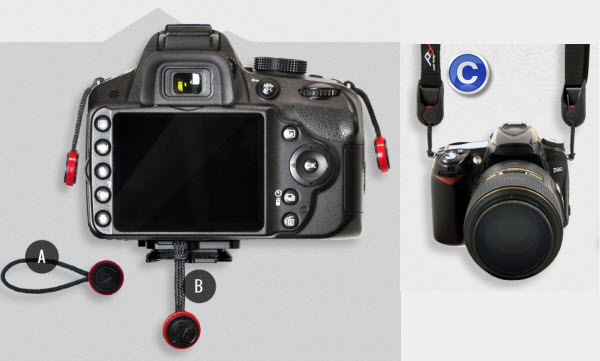 Attach the strap to your belt at one end and the camcorder at the other. Extend your arms until the strap is tight and then raise the camcorder to shooting height. With the Leash kept taught, you get a third point of support and much steadier shots. As a bonus, you can use the Leash and the Capture camera clip together. Shooting out the open window of a helicopter, I want to make sure there is absolutely no way my camera is going to fall from my hands. With the Capture clip attached to my shoulder strap, it’s secure when I’m seated but ready to go when I want to start shooting. With the Leash attached to the camera base plate, I know it can’t fall even if I lose my grip when holding it out the window. Both these devices were extremely well thought out and deserve a look by any active photographer. Check them out at http://peakdesignltd.com.